Eric's Review - This seems like a pretty good card, even if you cast it without Strive. 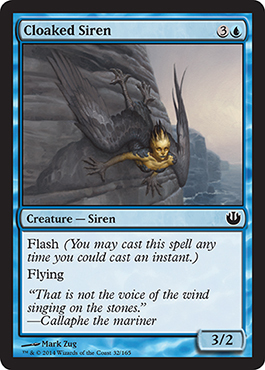 It's a much better card than Jump or any other common for one blue that gives flying for a single turn. Bottom Line: Great for limited, possibly will show up in Standard. Devin's Review - Like B/W heroic had to be better, Pumping a guy and giving it evasion is just absurd in limited not counting that late game it can hit multiple creatures. Eric's Review - This is one of the best cards in this set! 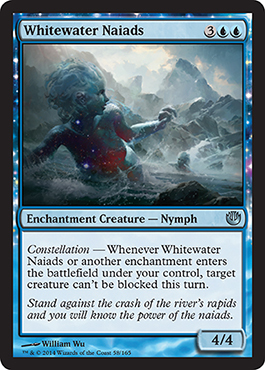 This cheapens the cost of casting instants and sorceries and even reduces the cost of cards with Strive. 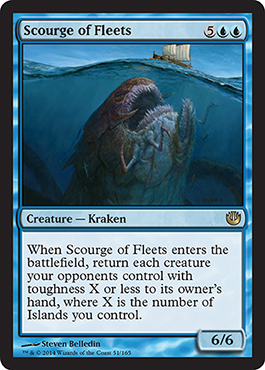 It is especially good in that Launch the Fleet can target as many creatures as you want just for a single white mana. Bottom Line: Buy it and use it. This will definitely be seeing play anywhere Strive will be used. Devin's Review - It's heroic ability seems a little underwhelming, but it's second ability combos so well with a lot of cards and abilities that it is hard to even comprehend the power of this card. To me only time will tell how great this card will be in any format. Eric's Review - This is a cheap card for limited. You can easily flash in a blocker or just attack in the air with your 3/2. Bottom Line: Great for limited, not so much for anything else. 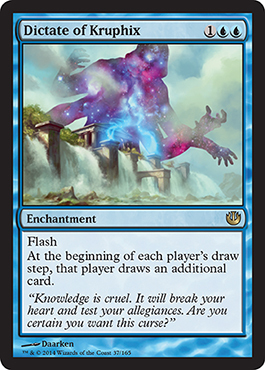 Devin's Review - I like this for limited 4 mana for 3/2 flier isn't that bad, but once you add flash you are getting a great limited card for blue that i can't wait to play in sealed and draft. Eric's Review - Interesting... It's a Counterspell that also mills four cards. I don't play around much with mill decks, but it seems to me that this will go into a mill/control deck pretty well. Bottom Line: Not a card for everyone. It will find its place in a select type of deck if at all. Devin's Review - Just what a casual mill deck wants it controls your opponent and mills them four. 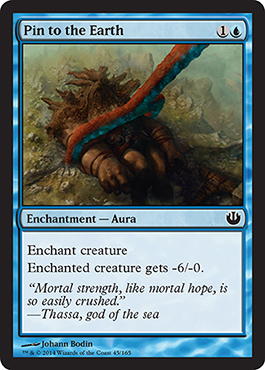 Though this card belongs on the kitchen table or at your local fnm, i won't be stopping you from drafting this common. 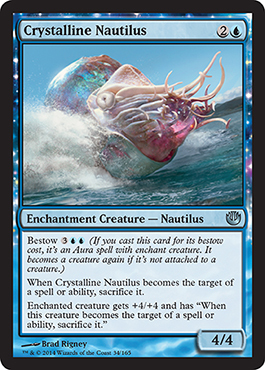 Eric's Review - So this creature is like an illusion because it is forced to be sacrificed when targeted by a spell, but for three mana, it's not a bad 4/4. Of course, it does prevent any possibility or equipping an artifact or targeting with a spell, but if you want a 4/4 beater, this is the one you want. Bottom Line: Good for limited, probably won't show up in Standard. Devin's Review - This card does a lot in limited, it can be removal, pump one of your guys, and it is good even when not bestowed. Just a great blue fatty for LIMITED. Eric's Review - This counters Courser of Kruphix. You can easily take away cards from your opponent's library. I like this. 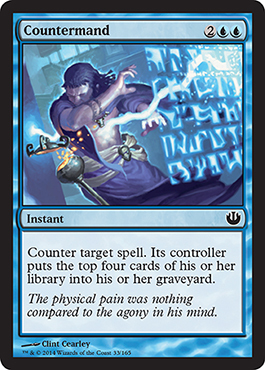 Bottom Line: Probably will mostly show up in Mono-Blue Devotion decks and control decks, but it is pretty good. 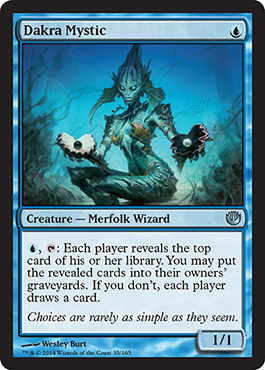 Devin's Review - This could replace one of the one drops in MUD, but besides that isn't going far in constructed though it is a nice blue creature for limited. Eric's Review - Well, as much as I like thieving decks, this is a card I don't want to go against. This will easily allow any mana dork controlled by an opponent be traded for some very significant card. Bottom Line: I see this in the future of Standard. It's powerful for a stealing card. Devin's Review - I am not sure how i feel about inspired even after having around 3 months to play with it. This card i like for EDH and limited but i am just not sure how it will perform, it could be fantastic, it could be a complete whiff. Only time will tell. Eric's Review - Perfect for EDH. This is not for Standard because card advantage is key. Bottom Line: Will see play in EDH, probably will see play in Standard by players new to the game. Devin's Review - Nekusar, the Mindrazer. I like it a howling mine with flash, Can't wait to play it in EDH. Though i do not know how it will perform in any other format,(just from inexperience) but can't wait to see the results. 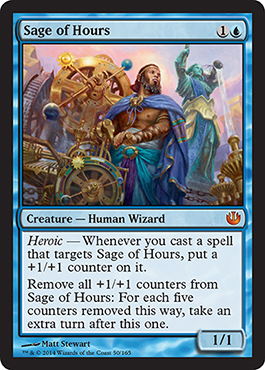 Eric's Review - It's a bit slow in comparison to Divination, but it triggers enchantments for a turn and works if you get mana screwed. Seems good. Bottom Line: Limited, EDH, and Standard will most likely see this played. Devin's Review - Not that bad of a draw spell in limited. while it does cost overall one more mana than divination, Divination doesn't wait, it doesn't trigger constellation, it can't be activated at instant speed. 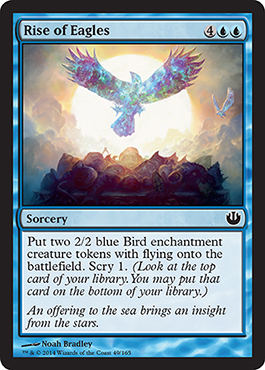 I love this card it may even replace divination in my EDH decks, it may even see some standard play though those are some high hopes. Eric's Review - I'm actually building an EDH deck around Whelming Wave and this will fit in it. 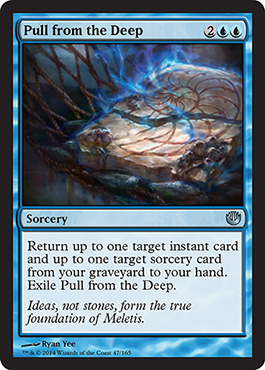 I do not see this going anywhere else, but once you attach something like Spreading Seas to an opponent's land, they have an enchanted permanent. Bottom Line: EDH in Islandwalk decks. Not much else for this card to fit into. Devin's Review - I do not like this card it is so underwhelming in any format it just feels weak. Though the flavor text is pretty nice. Devin's Review - The new Rapid Hybridization? 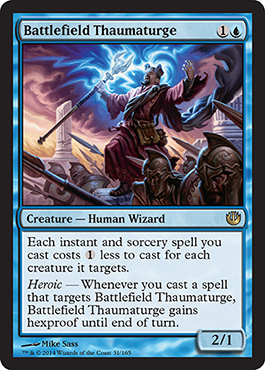 To me this card read more like a creature with a casting cost of 2U that is a 4/4 flier with flash and has the ability that whenever CARDNAME enters the battlefield exile a creature if you don't no creature for you. 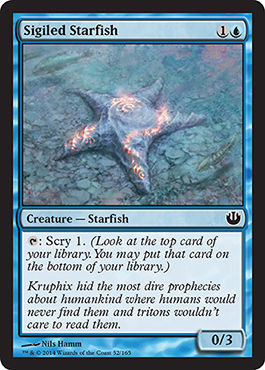 I like this card but will almost always treat it as a creature. Eric's Review - This works if you aren't going against hexproof things. Could show up in Modern, maybe, but I don't see it being too popular. Could show up in Standard, but it would most likely be a sideboard card. I do expect to see this in limited, especially at the prerelease. Bottom Line: Limited, yes. Standard, maybe. Modern, probably not. EDH, seems good. Devin's Review - It is great to target your opponents voltron that is built out of bestow creatures but horrible to hit his regular aura voltron, Great though for this limited format. Eric's Review - More thieving deck cards. 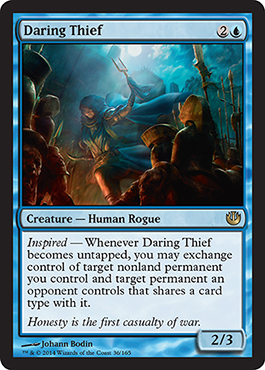 I guess I may have to play some sort of theft deck in the new Standard. Bottom Line: Probably will be showing up in Standard. Devin's Review - A spirited Away with body. It is not that good for any real constructed format, and will see it's play on the lunchroom table of kids just learning Magic. 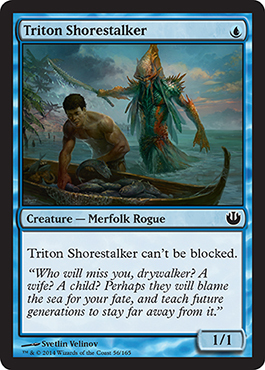 Bottom Line: I wouldn't play it outside a High Tide deck in Legacy. It's just not worth it. Devin's Review - This card is a real hit and miss could be great could be horrible. Real needs to be tested to understand it's power. Eric's Review - This is actually pretty good for control. Of course, this has to do with enchantments, but if you play Bogles in Modern, you'll want one of these. Bottom Line: This will likely be a Modern sideboard card with only one or two of these. Devin's Review - Well i guess no unsummon for me. Eric's Review - Control decks will like this, especially when considering R/G Monsters in Standard. Bottom Line: This will see Standard play but probably nothing outside of that. Devin's Review - wow that is some pseudo removal for blue. I can't wait to play it in my favorite B/U control deck in draft and watch as my opponent squirms while i pin down their creature. Eric's Review - This will possibly make Biovisionary decks a possible deck to play. It will also make for a great card in EDH because you can take an opponent's powerful creature and turn all of your creatures into it for a turn. 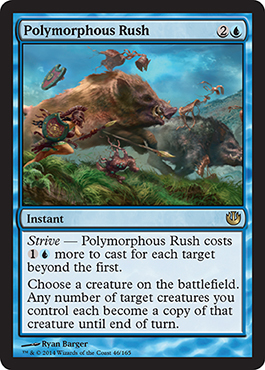 Bottom Line: This will most likely see play in EDH and Standard. Devin's Review - Pretty art. That is all i can get from this card it is just so weird, but it may be great in EDH. Eric's Review - This is not a bad card, especially in some blue/red decks in Modern that work on direct damage from spells. Control decks will also likely use this in Standard so that they can get one more Sphinx's Revelation. 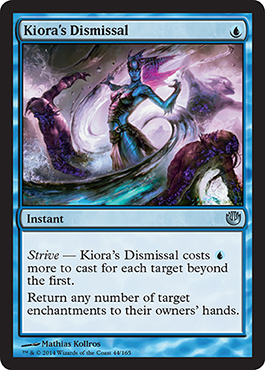 Bottom Line: Possibly will be found in control decks, likely will not show up outside of that unless in Modern direct spells/damage decks. Devin's Review - So many cards i would play over this card, and it is very underwhelming for this ability which i tend to find on the back of creatures. 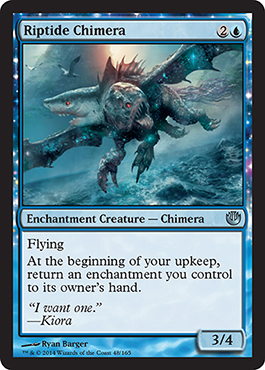 Eric's Review - Any time you have a creature this powerful with such a low mana cost, there has to be a downside, but the best part is you can grab an enchantment creature with bestow off the field and cast it bestowed on another creature. That's why this is good. 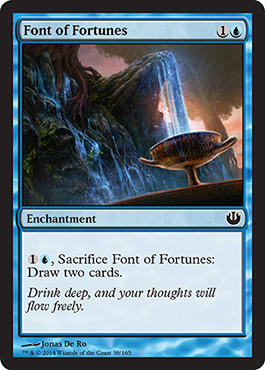 Bottom Line: Great in Standard for enchantment decks. Likely will be played in limited decks. Devin's Review - Beautiful art, wonderful flavor text, and not to bad of a card. Get this comboing with cantrip auras and heroic triggers. What some may consider a downside i consider a complete upside with a cherry on top. 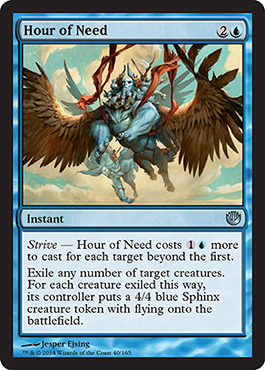 Eric's Review - It is a bit of a high cost, but each mana pays for 1/1 or for flying and that equals six mana (two 2/2 with flying) with a bonus of scry. Not such a great card. Bottom Line: I wouldn't play it in limited because it is too costly. Only if I didn't have a choice would I go for this. However, this would fit well with a pauper cube, I believe. Devin's Review - That is a very high cost that i can't wait to cast at the prerelease. Combo this with the interpret the signs draw six cards then next turn get some birds not to shabby. Eric's Review - Who doesn't like extra turns? The best part is you do not have to trigger heroic for the counters, you can just put counters on it any other way and trigger extra turns. 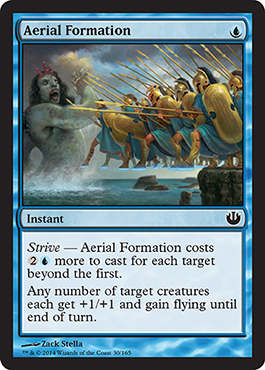 Bottom Line: This could see play in Standard and also in EDH. Probably won't show up in Modern though. Devin's Review - I like extra turns especially whacky ways to get them and just can't wait to play this in EDH and even in a nice standard Bant deck with the new Ajani. I really like this wacky card that isn't just take a turn. Bottom Line: Not great for Standard or Modern, or really any other format, however this will be pretty good in the EDH deck I'm planning. Devin's Review - I hate this card on a personal level. For both Theros and Born of the Gods i played blue at the prerelease, and both times i got this big splashy promo rare that one games by themselves. 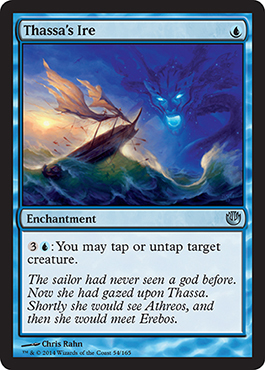 To me this card is horrible when compared to the monsters that were Shipbreaker Kraken and Arbiter of the Ideals, and almost pushes me away from blue at the prerelease. 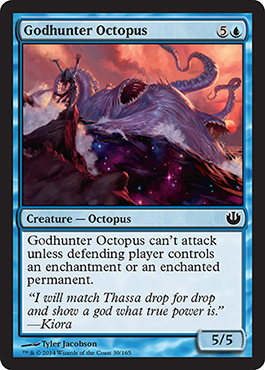 This card will be meh in draft and sealed but does have a nice art. Eric's Review - Everyone things this is amazing. I guess I don't see the appeal of a turn two 0/3 creature that can't tap to Scry 1 until turn 3. There are definitely better cards out there then this. Devin's Review - I enjoy scryfish, a blocker that gives you card advantage in limited. Eric's Review - It's for a mill deck, but it takes until turn 5 to cause anything to happen... Not so great if you ask me, especially due to the pace at which Standard games go. Bottom Line: Probably won't see play outside of limited, if even there. 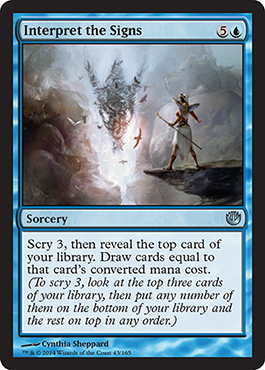 Devin's Review - This card like big butts and it can not lie, but aside from being sir mix-a-lot's favorite blue card in Journey into Nyx this card is very bad and kind of squeeze into your limited deck just not that good. Eric's Review - Well, for the ability it's not that great. There are things that I'd much rather do. Maybe an EDH card though. Bottom Line: EDH for sure. Devin's Review - 4 mana to untap or tap any creature not to shabby not sure what to do with it but in limited i can't wait to trigger inspired with this guy. Eric's Review - Decent, I guess. Not that great though even in comparison to other cards in the set. 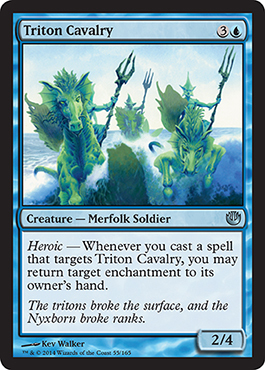 Devin's Review - A watery Pillarfield Ox that has a bad situational heroic trigger. To me it is no better then it's white predecessor and this one is uncommon. Eric's Review - Unblockables are back. Interesting. Could be good. We'll just have to see where this goes. Bottom Line: Seems good for Standard, EDH, and Limited. Devin's Review - Creepy flavor text on this card when you add it to the art. A great guy to make a boat out of in limited that is about it. Eric's Review - It's got a bit of a high cost, but Heroic should allow this to carry on just fine. Bottom Line: Limited is good and budget Standard decks it is. Devin's Review - Like many heroic fliers this is good. 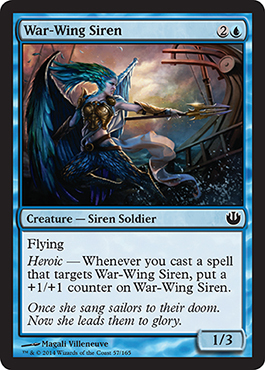 Great add into W/U heroic in limited. Eric's Review - Well, not a great card for Standard, but could be good for limited (depending on the number of enchantments in your deck that you haven't played before getting to this one). Bottom Line: This is just okay. I probably won't use it. The plus side is that this is great art. Devin's Review - This gives all my enchantments the abiltiy to make a guy unblockable not that bad when you think of the limited decks that would run this. Can't wait to play this in limited.